I received samples of Nairn’s cookies ($5.79 value) in exchange for this review. Any opinions expressed here are honest and my own. Are you looking for healthier yet not boring snacks? 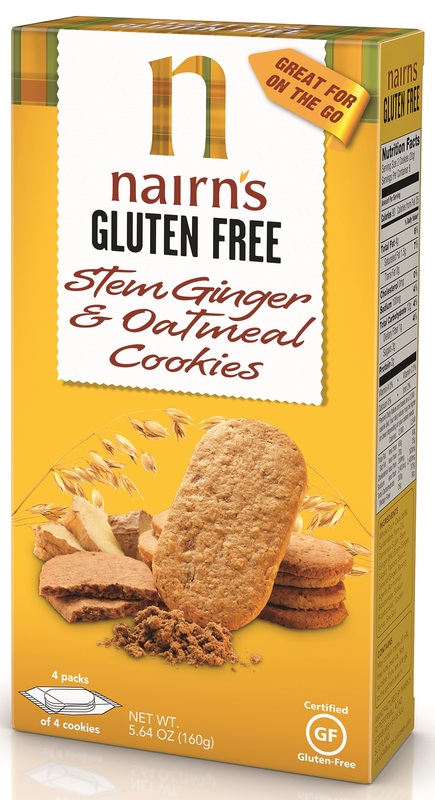 You may be interested in trying out Nairn’s Gluten Free Stem Ginger and Oatmeal Cookies! I recently received these snacks to try out. The cookies come in nifty pouch packs which makes it easy to just grab and go on those extra busy days. I love that the gluten-free cookies are only 90 calories per serving (2 cookies), 3 grams of sugar, 12 grams of carbs, and only 4 grams of fat! My very first bite was an interesting one. You can most definitely taste the ginger in the cookie. I honestly had to acquire a taste for it. After a few bites, I ended up really liking them. My 9-year-old likes them too. Sadly, my hubby and two other kiddies just couldn’t acquire a taste for them. Maybe in a different flavor? If you would like to learn more about Nairn’s gluten-free cookies or their other products, check out their Facebook page! There you will find more details about the product, website info, and more! I would like to thank the folks over at Nairn’s for allowing me to try out their products. They are tasty and can’t wait to try other flavors!